F. 1/c Joe H. Daugherty, son of Mr. and Mrs. Claud Daugherty, attended school in Grandfield; husband of the former Irene Meaders. 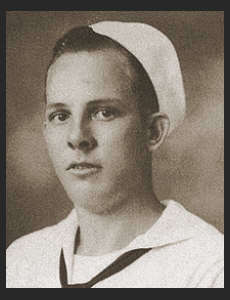 Entered the Navy in March 1944, trained in Cammp Peary, Va., Jacksonville, Fla.; served aboard the U.S.S. Omaha; was discharged in Nov. 1945.